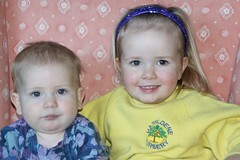 Today I went to nursery for the first time and Amaia was 1. I was put in the blue group and there were lots of new friends to play with. I played in the sand and my teacher was very nice to me. It was a very exciting day for both of us.